HA NOI (VNS) — A draft of the revised Penal Code was yesterday discussed at the opening of the 41st session of the 13th National Assembly (NA) Standing Committee in Ha Noi. The draft will be presented to the next meeting of the legislature. It will focus on the supplementation of new charges and, in some cases, the removal of the death penalty. Nguyen Van Hien, chairman of the NA Justice Committee said the existing Criminal Code still had some big hitches. Hien said many deputies had proposed to drop Section C, Item 3 of Article 39 which stipulates that the death penalty shall not be applied to those committing offences for economic purposes if they managed to repair the consequences after they were convicted. He said this could lead to people saying that money could be used to escape the extreme penalty. Most legislators agreed that the concept "economic crime" was not clear and called for concrete regulations. Accordingly, the NA Standing Committee recommended that this section should be rewritten to state that the death penalty would not be imposed on those producing and trading fraudulent medicines, as at present, and those who committed corruption. However, Minister of Justice Ha Hung Cuong said the possible exemption should not be used for those convicted of receiving bribes because that offence was extremely serious. 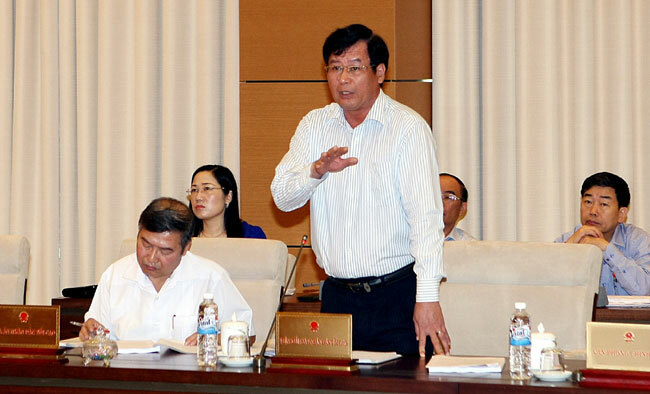 NA Chairman Nguyen Sinh Hung said the main spirit of modern law was to mitigate death sentences. Hung said this was why he approved the abolishment of the death penalty on criminals aged 75 and above due to humanitarian and international reasons, noting that serious criminals still faced life imprisonment. NA Vice Chairman Uong Chu Luu said most deputies agreed to remove the penalty for women who were nursing children under the age of three years, suggesting that the length of sentencing could be increased. However, they stressed the need to carefully consider removing the death penalty for genocide and other war crimes. During the morning session deputies also discussed whether they should drop offences that infringed on State regulations on economic management and causes serious consequences. The Justice Ministry suggested to replace the offence with more specific crimes defining serious violations. It said that if needed criminal penalties should be applied to ensure the transparency and safety of the production and business environment. Nevertheless, deputy head of the Supreme People's Procuracy of Viet Nam Tran Cong Phan said a big obstacle facing the Penal Code was that the current law had 246 articles, but only 60 had guidelines for enforcement. Later in the day, the committee heard a report on the outcomes of Viet Nam's economic integration since joining the World Trade Organisation. Other draft documents to be debated at the session include an amended Law on Pharmacy, Law on Planning, Law on Press (revised), Law on Association, Law on Administrative Decisions, Law on Export and Import Duties (amended) and Law on Professional Soldiers and National Defence Workers.